Imagine this situation; you decide that you want your house painted. You open up the phone book and call 5 decorators. When they arrive at your home – you examine their portfolios and then tell them that while you can see they are talented, they aren’t quite experienced enough to do the job but as a means of getting that experience they can paint your house for free and you’ll let them add a photo of it to their portfolio. What are the chances of getting your house painted for free? You could pull that trick with a million decorating firms and not one of them will ever do the job for free. That’s because their time, labour, etc. have value. Most of them would be likely to call you nasty names too. Yet, this is exactly what freelancer designers do every day. They’re told; you don’t have the experience so why not work for free and get the experience? And they do. Let’s be honest about this. If you really have no skills; you probably shouldn’t be freelancing in this area in the first place. If this is the first time you’ve opened Photoshop; you aren’t ready to sell your work to anyone. You need to develop experience and that starts by developing your skills. College and training providers are the places for learning skills and so is full-time employment. You need to develop your abilities before you try and sell them. OK, so you’ve got the skills but you don’t have the experience. It can’t hurt to work for free right? We tend to disagree with two real exceptions – the first is charity work. If you’re going to give your work away; why not give it to a good cause? Not only will you get experience, and help people, but you will also start to build a network while working for a charity where you might be able to sell work at a later date. The other is for your own marketing purposes. You can design, for example, a logo for an imaginary company and put together a brand story etc. for it too. You don’t have to surrender the copyright to this work so you can use it over and over again too. That’s much better than working for someone else’s business to make them money while not getting paid right? Whenever you try to win work you should be pushing relevant experience; generic portfolios are a bad idea. Ensure that you always put the most relevant work you have in front of a client. Some of them will still try to get you to work for free; in this case – walk away and walk fast. 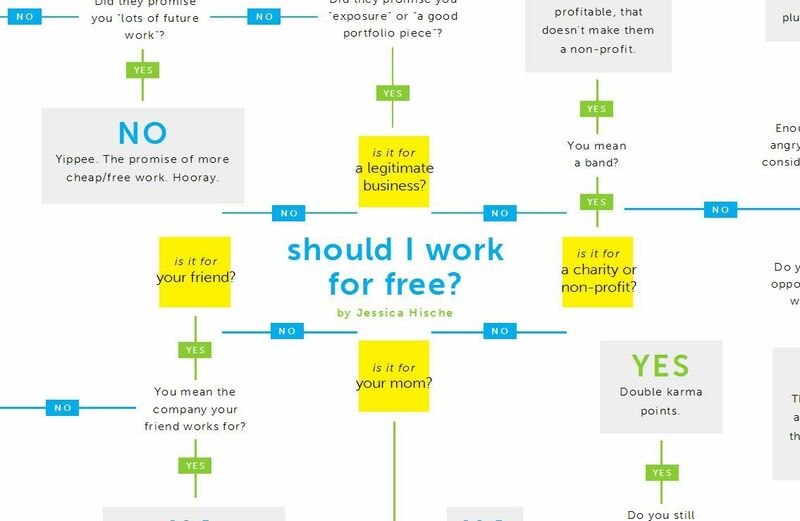 If you’ve been working as a professional for a period of time; you’re experienced and there’s absolutely nothing that could justify working for free for another business. If they can’t see your value – let some other mug work for nothing.